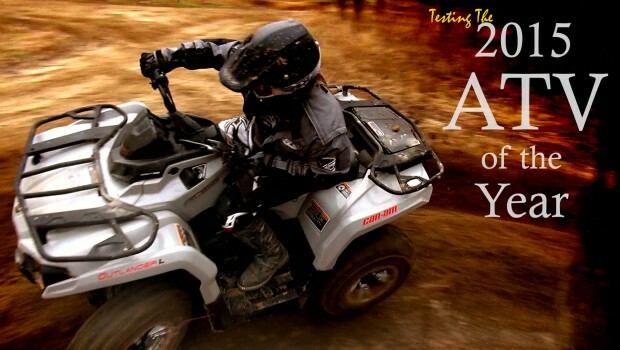 Riding the 2015 ATV of the Year! The Can-Am brand has always been synonymous with performance. 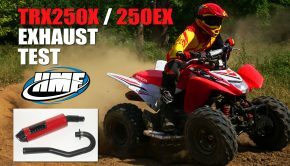 All it takes is a brief look at their ATV lineup to understand why, with features like v-twin engines in their 500cc and larger 4×4 ATVs, plus their unique chassis and suspension designs. Unfortunately, striving to push the performance envelope doesn’t usually lead to moderate retail prices that appeal to the masses. 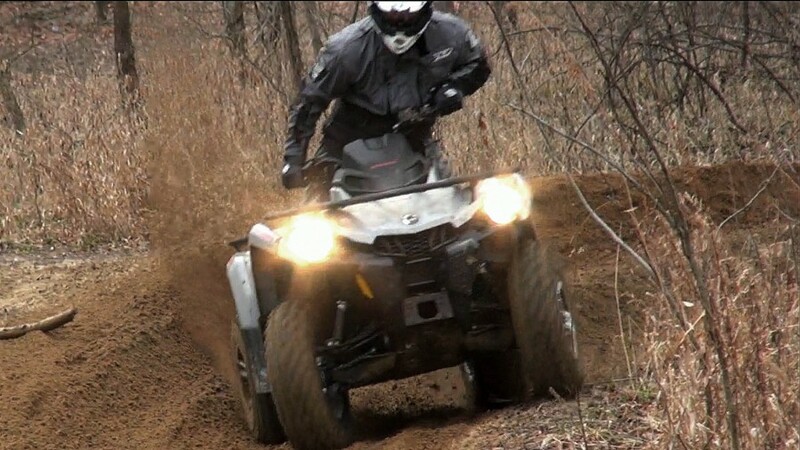 When it was released, the Polaris Sportsman 500 was the biggest 4×4 ATV on the market. 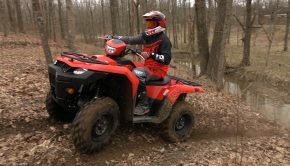 With years of refinement, a new fuel-injected 570cc engine, and a retail price tag that dates back to its 1996 launch year, the Polaris Sportsman 500, now 570, remains a leader in sales numbers, offering a full-size chassis and mid-bore displacement at a compact, 400cc retail price. So what does a company that’s focused on performance come up with when designing a new model to rival the most value-packed and best-selling 4×4 ATV currently on the market? Can-Am came up with two machines inspired by performance slightly altered to achieve a competitive price point, while providing piece of mind that will last as long as a finance plan. They came out with the 2015 Outlander 450 and 500 L.
The base model 500 retails for $6,999. That’s just $500 more than the Polaris Sportsman 570. 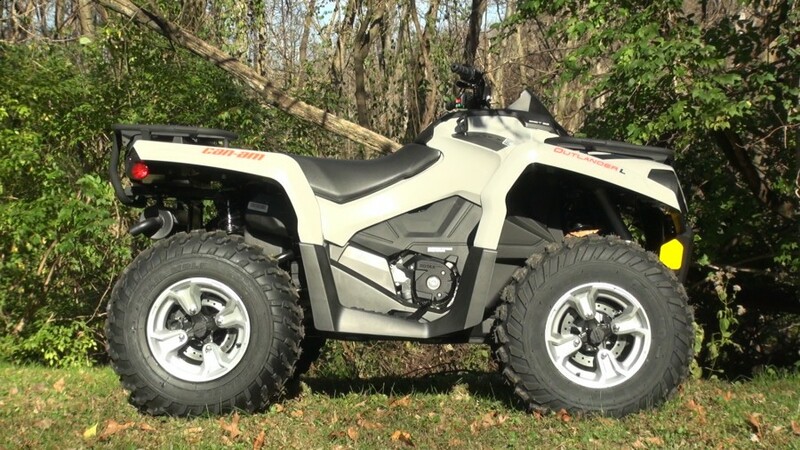 The DPS model we’re testing, features Can-Am’s Tri-Mode Dynamic Power Steering and cast aluminum wheels, retails for $7,899; once again, just $500 more than the power steering-equipped Sportsman 570. The difference in pricing is slim enough that most buyers will be purchasing based on which machine they like better, not which one they can afford. The Outlander’s v-twin engine is more expensive to produce, and its G2 chassis design, introduced in 2012, is still relatively new technology. Those items alone are enough to justify the difference in price, but then, Can-Am threw in a mind-blowing 5-year extended warranty that will cost Polaris 570 buyers $945! 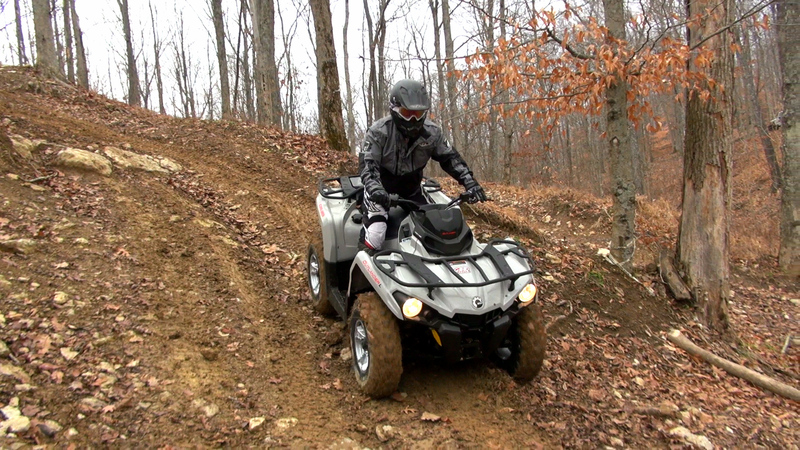 Haspin Acres in Laurel, Indiana provided lots of varying terrain to put the Outlander L to the test. Fly Racing decked out our new test rider, Damon James, in its Maverick Dual Sport Boots, featuring a shorter height and cleated sole; Patrol Pants and Jersey; 907 Cold Weather Gloves; Kinetic Impulse Helmet; Focus Goggles; and Patrol Riding Jacket. Things really start to come alive as the engine delivers a surge of power entering the midrange. Its top-end engine seems willing to rev to the moon, hitting 62 mph and still climbing in a 1/8-mile drag race. The heart of the 500 L is a 499.6cc, liquid-cooled, v-twin, Rotax engine with single overhead cams and four valves per cylinder. Fuel injection delivers air and fuel to the engine via dual 46mm throttle bodies. This engine was most recently updated in 2013 with a focus on improving low-end power and snap. According to the California Air Research bureau, the 500 is said to produce 45.6 horsepower, up from the claimed 40.4 horsepower on the 2012 model. The transmission features high and low forward ranges, plus neutral, reverse, and park, selected by a smooth-shifting, low profile, gated shifter. On the L model, a standard key switch replaces Can-Am’s Digitally Encoded Security System key. (D.E.S.S.) is great as security goes, but should you lose the digitally encoded key, it will cost you a little more money to replace and require a visit to the dealer. The Outlander 500 roars to life with its sweet V-Twin sound and is ready to go with minimal warm-up time. Most machines in the 450-600cc 4×4 ranks deliver their best power in the first half of the throttle. 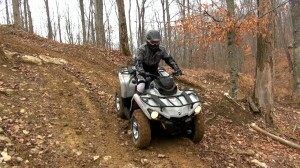 The Can-Am takes the opposite approach.Bottom-end power is smooth and mellow when you roll on the gas. Even if you crack the throttle, the low-end power never feels overwhelming. A little more low-end snap might be nice for wheeling over obstacles; however, its smooth delivery comes in handy when traction is sparse and you don’t want to spin the tires. Things really start to come alive as the engine delivers a surge of power entering the midrange. While we wouldn’t call it abrupt, when you crack the throttle hard at lower speeds, the midrange rush is pronounced. 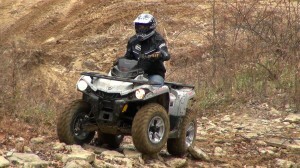 It adds to the machine’s fun factor accelerating out of turns and provides plenty of thrust for conquering big hills. Its top-end engine seems willing to rev to the moon, hitting 62 mph and still climbing in a 1/8-mile drag race. 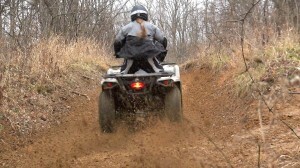 The Outlander’s engine could be the king of its class when it comes to letting it rip in fast trails. The transmission’s low-range allows the Outlander to make good use of the engine for hauling, towing, or picking your way through challenging sections. The transmission’s low-range allows the Outlander to make good use of the engine for hauling, towing, or picking your way through challenging sections. The broad power band of the 500 allows you to remain in low range for short, faster-paced runs between tough sections. 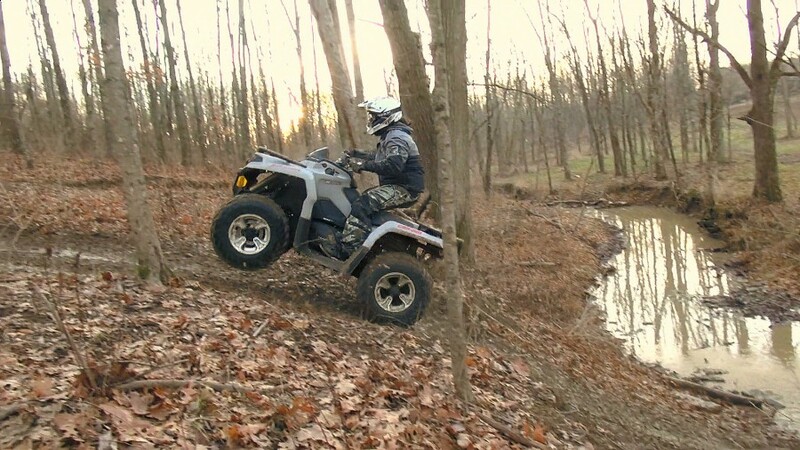 our test riders felt the recently upgraded Vicso-Loc QE, or quick engagement version, which Can-Am included on the L models, provided light steering, good forward traction, and received no complaints regarding engagement. A switch by your right hand selects between two and four-wheel-drive. With Can-Am’s Visco-Lok QE front differential, the front end offers the easy steering of a limited slip front differential. However, when one of the front wheels begins to lose traction, the Visco-Lok QE system progressively locks in both front wheels providing true four-wheel-drive. When traction is restored, the front differential progressively unlocks. We challenged the Visco-Lok system with some slick, hilly trails and a gnarly, rocky climb. We’ve seen people complain about sluggish engagement on Can-Am’s Visco-Lok in the past. However, our test riders felt the recently upgraded QE, or quick engagement version, which Can-Am included on the L models, provided light steering, good forward traction, and received no complaints regarding engagement. 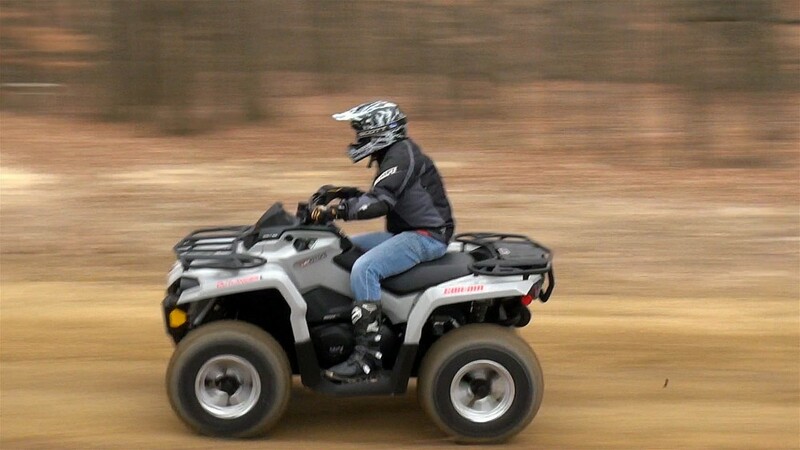 The Outlander L features Can-Am’s Surrounding Spar, G2 chassis, originally released in 2012. Constructed of steel, the G2 frame incorporates different manufacturing processes and updated geometry for improved handling, increased strength, and improved durability. The new chassis and rear suspension were calibrated to promote the rear suspension squatting under hard acceleration to improve traction. The G2’s redesigned front end features what Can-Am calls its, “dive-control and anti-kickback geometry”. The revised front-end geometry was designed to keep the front end from diving during hard braking, or while descending steep hills. To reduce bump feedback to the rider, the steering knuckle is located inside the front wheels. Compared to the premium 500 model, the L received reduced caster to lighten steering effort. Five-way, preload adjustable shocks reside at all four corners, and Cam-Am makes taking advantage of their adjustability easy with the needed tool included in the tool kit. The Dual-Arm front end features 9 inches of travel. 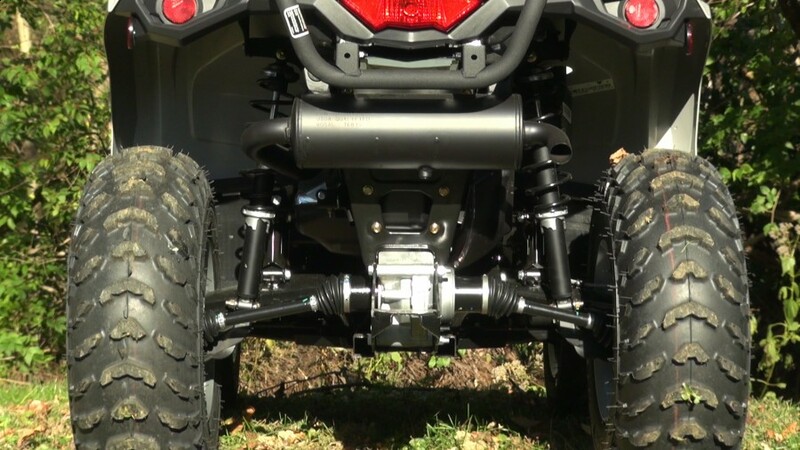 The Torsional Trailing Arm Independent rear suspension features a simplified trailing arm design and a half-inch less travel than the premium 500, with 8.8 inches of travel. The Outlander sits 46-inches wide, with a wheelbase of 51 inches. The Base model Outlander L comes with black steel wheels, while the DPS model comes with cast aluminum wheels. Both the standard and DPS models comes with premium Carlisle Trail Wolf Tires. The 25-inch tires are one inch shorter than the 26’s found on the premium 500. The L’s tire and rear suspension changes result in ½ inch less ground clearance at 10.5 inches and a seat height that’s 7/ 10 of an inch lower at 33.8 inches. As sporting enthusiasts, these numbers indicate a lower center of gravity. If you feel you need more than 10.5 inches of ground clearance, it’s just a tire swap away. All of the changes also result in a machine that’s 25 pounds lighter, with the 500 L’s claimed dry weight of 703 pounds. In corners, the Outlander L feels predictable and pretty stable. There is some body roll when cornering aggressively, but it never felt like it was going to get away from us unexpectedly. In corners, the Outlander L feels predictable and pretty stable. There is some body roll when cornering aggressively, but it never felt like it was going to get away from us unexpectedly. The Can-Am prefers to be driven out of corners hooked up, whether you are cruising along or racing with your friends. Power slides on loose, smooth turns are no problem. However, the mellow, low-end power makes getting the back-end to step out trickily when traction is abundant, requiring you to carefully time your corner entry with the engine’s midrange hit. Thanks to receiving the G2 chassis, the Outlander L handles quite well. We found the old SST chassis and suspension combo spooky on side hill trails. The new G2 setup rolls less and is more confidence inspiring. The front end feels well planted on climbs and the anti-dive front end eliminates the old seesaw feeling you got when going from the gas to grabbing a handful of brakes on the old chassis. We found the old SST chassis and suspension combo spooky on side hill trails. The new G2 setup rolls less and is more confidence inspiring. Thanks to receiving the G2 chassis, the Outlander L handles quite well. The DPS model comes with Can-Am’s Tri-Mode Dynamic Power Steering. The Tri-Mode system operates like most other power steering systems but provides the option of three different levels of assist. The Dynamic Power Steering’s low assist was ideal for smooth, high-speed trails, the high-assist setting was best suited for rock crawling and work duties, while the middle setting was good for all-around riding. Steering action on the Outlander is responsive and pretty accurate. That makes it fun on tight switchback trails. There is a little trade off in high-speed stability where the steering feels just a bit overly sensitive. Perhaps all are due, in part, to the reduced front-end caster found on the L model. 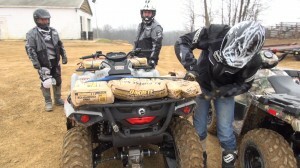 Our riders agreed that Can-Am’s Tri-Mode DPS system is more than a gimmick. They felt that low assist was ideal for smooth, high-speed trails, minimizing the steering’s high-speed sensitivity. The high-assist setting was best suited for rock crawling and work duties, while the middle setting was good for all-around riding. The L’s suspension provides a plush ride over smaller bumps at slow speeds. 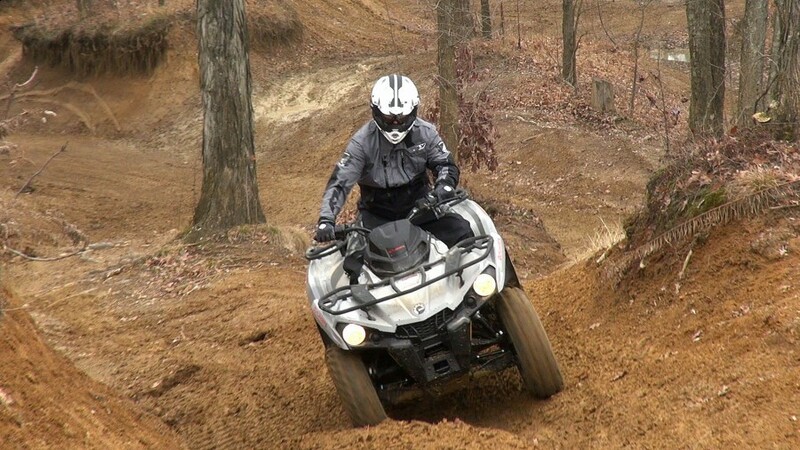 In high-speed, choppy, or rough sections, it’s kind of like riding a very plush sport quad. The suspension works best when you are on the gas, driving the rear wheels into the bumps and keeping the front end light. The shocks offer a good amount of bottoming resistance for jumps and g-outs as we only managed to bottom the front shocks on a couple occasions. The Outlander’s shocks come set in the middle position from the factory, allowing you to soften or stiffen the ride to suit your riding style and use. After three days testing and tuning, we ran the L’s front shocks one notch out from full stiff, and backed the rear shocks’ preload all the way out. Softening the rear shocks improves the ride, enhances traction, and lets the machine track more predictably through rough sections, without creating a bottoming issue on big hits. Our softer rear setting also let us drive harder out of turns, as the rear end would squat further, lowering the machine’s center of gravity, and transfer less weight to the outside front wheel, reducing body roll. Adding one notch of preload to the front shocks from the stock setting further reduces body roll, and adds a bit more bottoming resistance, while remaining compliant through small bumps. 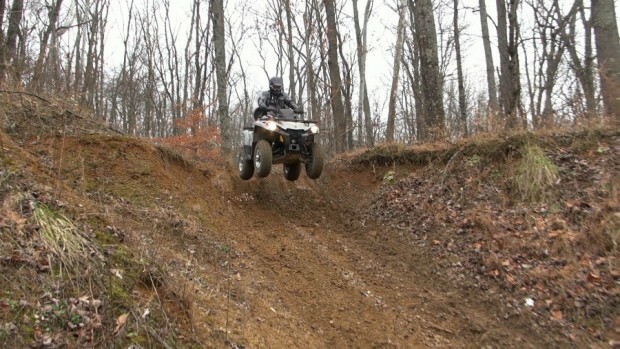 This suspension could go from work to play and back again with just a little adjustment. 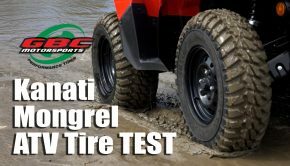 Carlisle’s Trail Wolf tires offer good traction and directional control on intermediate to hard-packed conditions. They also provide good grip crawling through rocky sections. Performance in sand was decent; however, they did pack up quickly in Haspin’s clay-based mud unless we kept the tires spinning. The brakes offer plenty of stopping power and provide good feel through both the hand and foot levers. The engine’s compression braking system offers a decent amount of assist scrubbing off speed. Can-Am slows the Outlander L with dual 214mm rotors up front with a single 214mm rotor out back. Both ends feature dual piston calipers, and steel-braided brake lines. The handlebar-mounted lever activates the brakes at both ends while the foot brake pedals the rear brake independently. The brakes offer plenty of stopping power and provide good feel through both the hand and foot levers. The engine’s compression braking system offers a decent amount of assist scrubbing off speed entering corners, and works well helping keep speeds under control on long downhills. Lighting was simplified a bit on the Outlander L; however, there is still plenty of candlepower for night riding thanks to the 70-watt headlights. The Outlander’s ergonomics beautifully balance comfort and control. You won’t find the standard ape-hanger-style utility bars on the Outlander. They seem a bit lower, narrower, and less swept back, putting you in a good position to attack the trail without making you feel cramped up. Combination floor boards with tall, wide, aggressively toothed, plastic pegs provide good footing and allow your feet to pivot when traversing rough terrain. The sides of the bodywork curve in making it easier to grip the machine with your knees, and the seat is one of the most comfortable we’ve ridden on any ATV. The ergonomics make you want to ride hard all day. The rear storage on the L was reduced a bit at 2.9 gallons, and the L receives steel racks instead of the composite racks found on the premium model. That’s cool, in our opinion, as they are super easy to attach items to. The Outlander comes pre-wired for easy winch installation. The ball mount-equipped rear tongue is rated to tow up to 1,300 pounds although we prefer a full-size hitch receiver. The rear storage on the L was reduced a bit at 2.9 gallons, and the L receives steel racks instead of the composite racks found on the premium model. That’s cool, in our opinion, as they are super easy to attach items to. The racks feature Can-Am’s Linq Quick-attach accessory system, and are rated to haul 20 pounds more up front at 120 pounds, and 40 pounds more out back at 240 pounds. 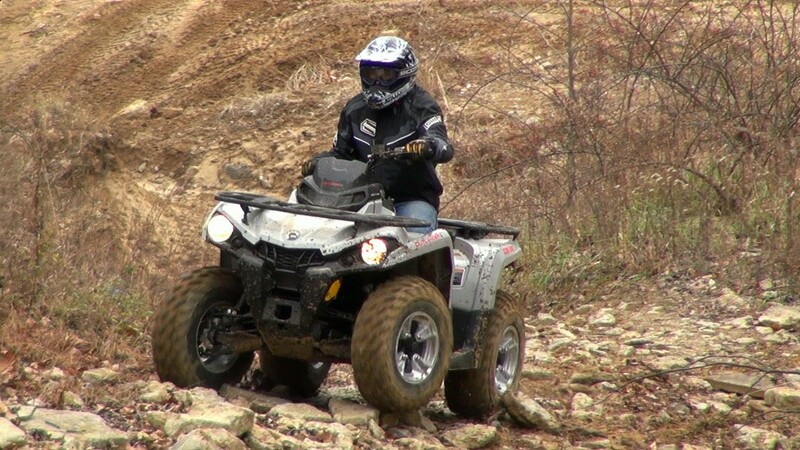 The Outlander L is a capable work and play 4×4 ATV that we feel is slanted just a bit toward riders who want to have fun on a very capable work machine. If you are wondering what the L in Outlander L stands for, it stands for Lite. When associated with food and other products, the word Lite is often accompanied with a lack of flavor or features. After three days of riding the Outlander 500 Lite, the only thing that it seems to be lacking is retail price. 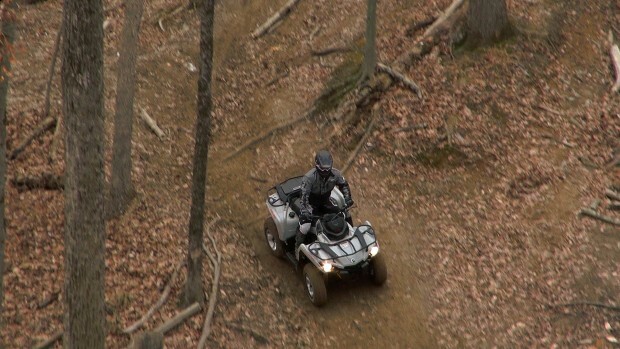 The Outlander L models are the only ATVs on the market to come with a five-year warranty standard. A comparable warranty for the Sportsman 570 will cost around $950, making it $450 more expensive; Suzuki, Yamaha, and Arctic Cat’s comparable models retail for between $400 and $1,800 more, and the longest standard warranty among them is only 12 months. If you want a warranty comparable to the Outlander L’s, expect to pay over $800 for it if the manufacturer offers one that long! The Outlander L’s performance would put up a real fight against any ATV in its class. 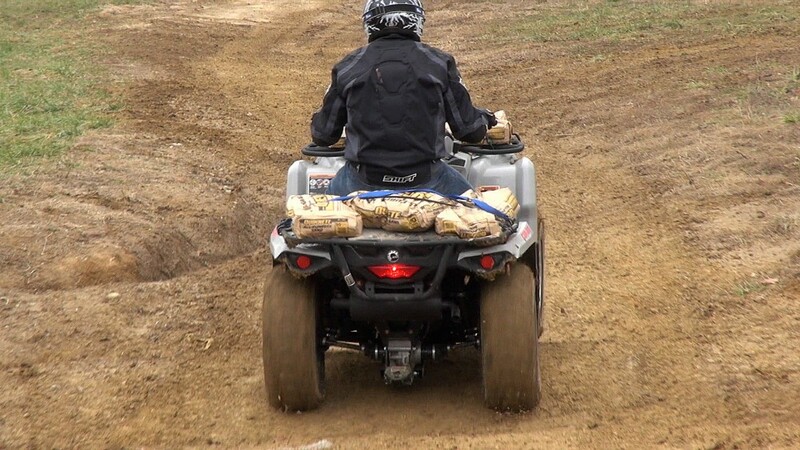 Built to go head-to-head with the Polaris Sportsman 570, we will have to let the two machines face off in a shootout to determine which is better at what as performance goes. We sincerely hope that its creation is a sign of a much-needed shift in the market, from who can build the largest, fastest ATV regardless of price, to who can build the most fun and reliable ATV, for a price that’s affordable for the masses. We’ve never been so bold as to crown a single machine as the, “ATV of the Year,” we couldn’t imagine picking any other machine than the 2015 Can-Am Outlander L 500. We’ve never been so bold as to crown a single machine as the, “ATV of the Year.” However, considering its strong performance, exceptional value, and potential positive impact on the ATV market, we couldn’t imagine picking any other machine than the 2015 Can-Am Outlander L 500. Summary: We’ve never been so bold as to crown a single machine as the, “ATV of the Year.” However, considering its strong performance, exceptional value, and potential positive impact on the ATV market, we couldn’t imagine picking any other machine than the 2015 Can-Am Outlander L 500.